Book Horde: CLFA 2017 Book of the Year Winners! CLFA 2017 Book of the Year Winners! Congratulations to the winners of the Conservative Libertarian Fiction Alliance 2017 Book of the Year survey! 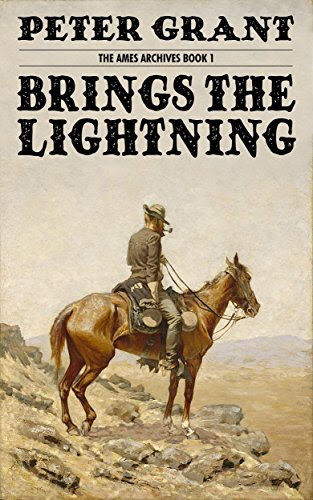 This year's First Place winner is post-Civil War western Brings the Lightning by Peter Grant. When the Civil War ends, where can a former Confederate soldier go to escape the long memories of neighbors who supported the winning side? Where can Johnny Reb go when he can't go home? He can go out West, where the land is hard, where there is danger on every side, and where no one cares for whom you fought – only how well you can do it. Walt Ames, a former cavalryman with the First Virginia, is headed West with little more than a rifle, a revolver, and a pocket full of looted Yankee gold. But in his way stand bushwhackers, bluecoats, con men, and the ever-restless Indians. And perhaps most dangerous of all, even more dangerous than the cruel and unforgiving land, is the temptation of the woman whose face he can't forget. When you can’t go home again – go West! 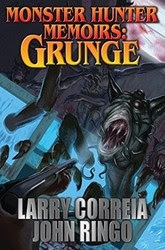 In Second Place is best-selling writers Larry Correia and John Ringo's urban fantasy action-thriller collaboration Monster Hunter Memoirs: Grunge. When Marine Private Oliver Chadwick Gardenier is killed in the Marine barrack bombing in Beirut, somebody who might be Saint Peter gives him a choice: Go to Heaven, which while nice might be a little boring, or return to Earth. The Boss has a mission for him and he's to look for a sign. He's a Marine: He'll choose the mission. Unfortunately, the sign he's to look for is "57." Which, given the food services contract in Bethesda Hospital, creates some difficulty. Eventually, it appears that God's will is for Chad to join a group called "Monster Hunters International" and protect people from things that go bump in the night. From there, things trend downhill. In Third Place is Hugo & Nebula award nominated John C. Wright's paranormal urban fantasy Iron Chamber of Memory. The small island of Sark in the English Channel is the last feudal government in Europe. By law, no motor vehicles run on the road, and no lights burn at night. Only the lord of the island may keep hounds.Into the strange, high house of Wrongerwood wanders Hal Landfall, penniless graduate student at Magdalen College, looking for his missing friend Manfred Hathaway, who has just inherited the lordship, the house, and the island. What he finds instead is the lovely, green-eyed Laurel, a beautiful girl from Cornwall who is Manfred's wife-to-be. A huge congratulations to the winners and to all the nominees!